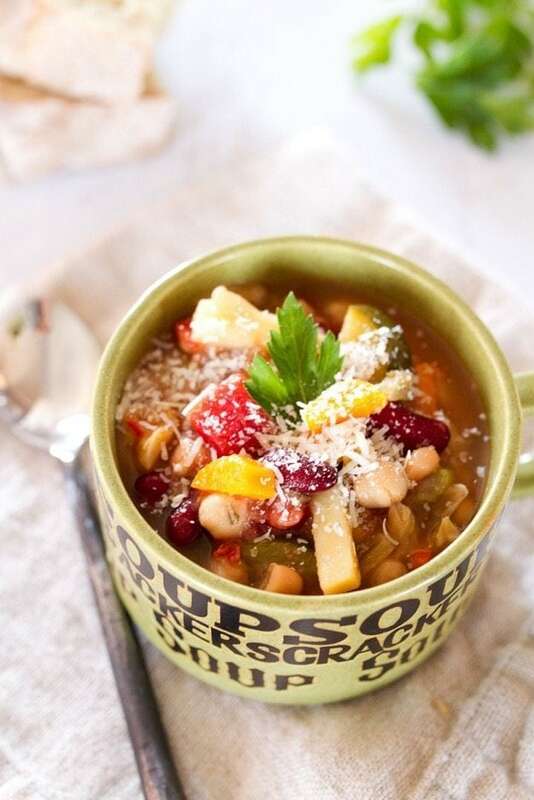 This slow cooker minestrone soup is packed with fresh veggies, beans and seasonings. Pop everything in your slow cooker and come home to a warm and comforting meal. I’m typically all about soup throughout the fall, but this year with the warmer weather I simply haven’t had a craving for it. Last week we had a little spurt of cold weather and I got all excited. I immediately pulled my slow cooker out and whipped up this soup. It’s funny because I actually really dislike cold weather, but if there’s ever I time I can tolerate it, it’s during the holidays. Temps in the high 60s and 70s around Christmas just doesn’t feel right. Plus, with how warm it’s been I feel like we’re going to be dealing with winter weather until late March. Ugh! Vegetables: carrots, onions, celery, tomatoes, potatoes, cabbage and zucchini. So much veggie goodness! It tastes great the first night, but even better the next. Isn’t that always the case with soup? The more time it has to marinate, the better! I made this last week while my cousin and her family were in town for the evening. I wanted something easy so that I could spend time visiting with her sweet babies rather than cooking in the kitchen. This soup fit the bill. And everyone loved it. 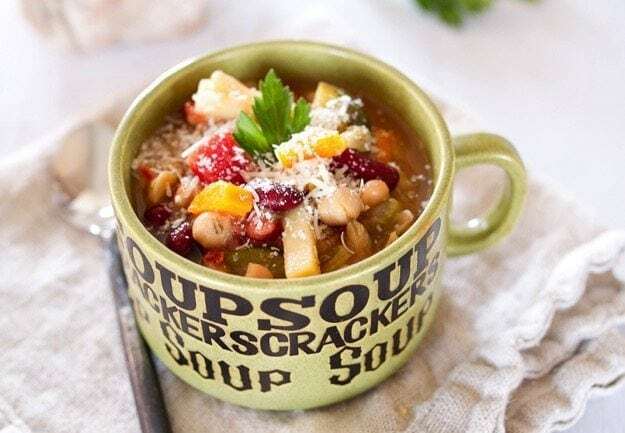 If you make this slow cooker minestrone soup be sure to leave a comment and star rating below letting us know how it turned out. Your feedback is so helpful for the EBF team and our readers! 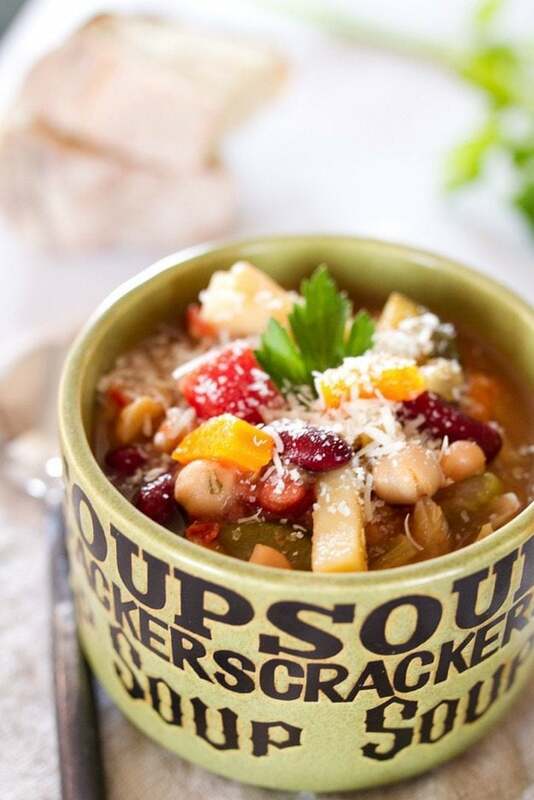 This slow cooker minestrone soup is packed with fresh veggies, fiber-rich beans and seasonings. Pop everything in your slow cooker and come home to a warm and comforting meal. Heat oil over medium heat. Add carrots, onion and celery and cook until onions are translucent and fragrant. Add in garlic and sauté for 5 minutes more. Add sautéed veggies and all remaining ingredients into the slow cooker. Cook on high for 4 hours or low for 6-8 hours or potatoes are cooked. Taste the soup before serving and season with additional salt and pepper if needed. Remove parmesan rind and bay leaf. Portion soup into bowls and top with parmesan cheese. 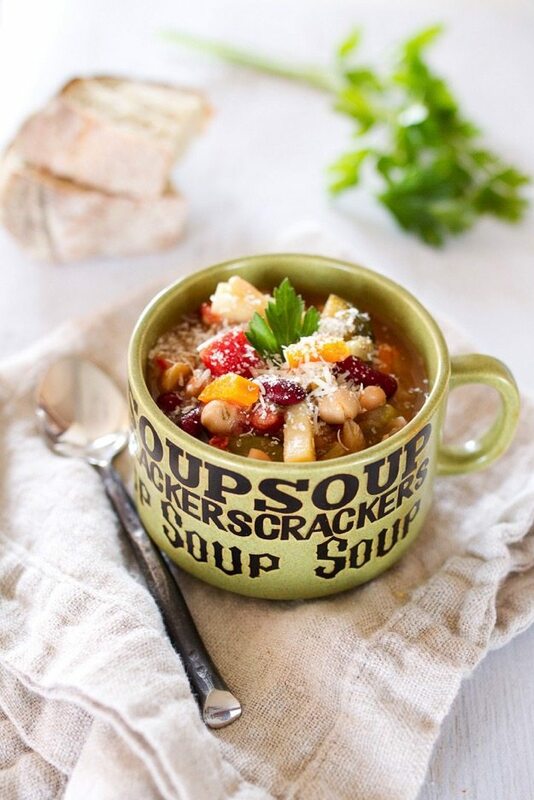 I LOVE this recipe and I love that soup bowl! Where is the soup bowl from, if you don’t mind me asking? If you want more soup bowls like that one then you can get them on Ebay but, boy will they ever get you on shipping. Im going shopping today and will make this tomorrow. 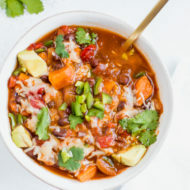 Ahhh I love slow cooker soups, and haven’t had minestrone soup in for-e-verrrrr. Looks and sounds delicious, and adding sriracha is never a bad idea! I love how colorful this soup is! I also like that no noodles are included. 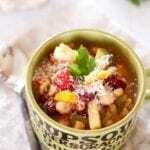 Most minestrone recipes include them and I’m not a fan, but this looks and sounds delicious! This soup looks so good! I love soup during the cold winter months. It’s the best! 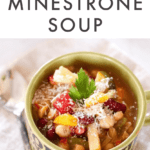 Minestrone is one of my all time favorite soups and I’ve been dying for a killer recipe- consider this one pinned 🙂 It looks delicious! ooooo digging this recipe!!! I love myself a good minestrone soup. Such a healthy comfort food style soup. Pinning this for sure! Added brown rice, amazing! Best meal to come home to after a long day 🙂 thanks! So glad that you enjoyed it, Rachel! Should this be Savoy cabbage? I’m unclear about what would be considered savory cabbage? Is it 160ml (2 cups) of water PLUS 1 litre (32oz) of stock? Was given a slow cooker for Christmas, so I’m new to this! Looks so yummy, can’t wait to make! Totally on my grocery list for making this week! I LOVE my slow cooker. I work full-time and it’s only my husband and me now that the children are grown and gone. My enthusiasm for coming home from work and cooking dinner has diminished so the slow cooker is perfect! What size serving is 1 bowl? Also, when I imported your recipe into MFP it came out to be 446 calories. How did you calculate yours? I’m not sure how many cups are in a bowl but the recipe should make around 8 servings. I used MFP to calculate the nutrition facts as well. Be sure to check all the ingredients and nutrition facts when you import. I found that sometimes when you import the recipe things can get misinterpreted. Maybe that’s what is causing the discrepancy? I made this soup 3 times over a two-week period. That’s how much I loved it. It’s now August and I’m still craving this soup. I have to go easy on the salt and ended up adding some balsamic vinegar for flavor. Can’t tell you how much it added to the flavor. Delicious. Do you need to drain the beans? Great question! All the canned beans in the recipe should be drained and rinsed. I’ll go in and add that to the recipe instructions. Can this soup be frozen? Am single and want to make this recipe but there’s no way I can eat 8 servings, haha! I get nervous freezing things as sometimes the food (especially some vegetables) do not thaw and reheat well. 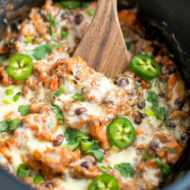 One of my go-to slow cooker meals. 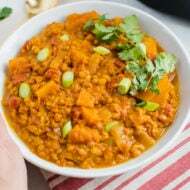 Have shared the recipe with friends who love it as well. It’s very light and healthy, but is delicious! I usually make one batch, use half for lunch for the week and freeze the other half. It freezes and reheats beautifully. Thank you so much for coming back to comment and leave a rating for this recipe. It makes me so happy to know that you enjoy it and I love knowing that it freezes and reheats well. Someone mentioned adding brown rice. Do you think it should be added raw at the beginning or cooked at the end? Hi Cindy. I’m not 100% sure because I’ve seen some slow cooker recipes with brown rice done both ways. I think it should be fine to add it uncooked at the beginning, but I’m not sure how much liquid the rice will soak up SO I think I’d recommend cooking the brown rice separately and adding it before serving. That way you can eye it and add just the right amount. I think it will be delicious and extra filling with the rice. Let me know how it turns out for you! I’m really excited to try this. I think I might try rutabaga instead of potatoes to decrease calories and carbs a little.